iYogi Tech Support Scam Busted! Washington State Attorney General Files Lawsuit. Latest Educative Article on Tech Support Scam phone call scams. iYogi and its President Vishal Dhar have been named in the lawsuit filed in King County Superior Court in Washington State for running a scam operation that uses deception and scare tactics to pressure consumers into buying unnecessary tech support services. Washington State Attorney General Bob Ferguson said the lawsuit against one of the biggest independent tech support providers in the worlde who employs more than 5000 workers in India. These call center workers are trained to lie that they represent Microsoft, Apple, HP, Dell etc and scare people with trash stories of virus and malware infection. 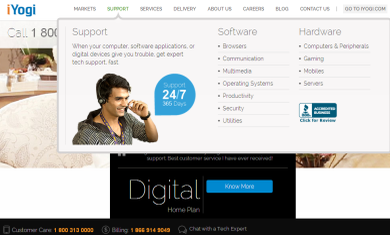 iYogi advertises online and has call centers in India and the United States. The lawsuit seeks to stop iYogi’s illegal business practices and recover money for Washington victims. The lawsuit alleges that iYogi induced consumers to install unnecessary software as part of its ploy to coerce them into buying tech support services, a violation of Washington’s Computer Spyware Act. Once iYogi has alarmed the consumer, the representative proceeded to aggressively sell a tech support plan to fix the non-existent problems for USD 140-379. Tech support scams has become a scourge defrauding 3 million people in the U.S. of more than $1 billion a year.